Student Support Manager, Ms. Wise, spoke to Mrs. Clark’s first grade class, at Winchester Village, about teamwork. What is teamwork? What is your part in being a team member? 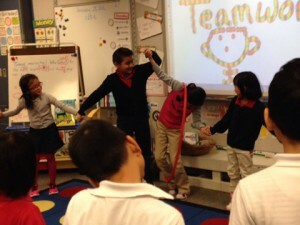 Students learned that teamwork is when a group works together to accomplish a goal. They learned that a group can be as small as two people or as large as a football team. In the first picture you can see students working toward a goal of moving the hula hoop around the circle without using hands and without breaking the circle. 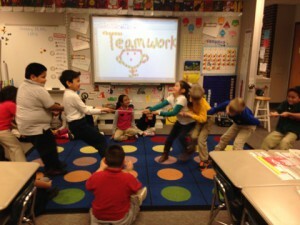 The other picture shows students playing tug-of-war with a goal to move the other team across a line.